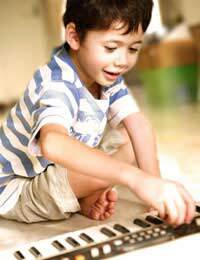 Often, parents think of nurseries and schools when they consider learning opportunities for their youngsters. In reality, though, children encounter situations every day that are rich with chances to learn, if only their parents and other carers know to capitalise on these occasions. For children, every experience is new, so things that adults barely notice can be interesting and exciting to kids. Even at home, opportunities for learning abound. Parents can help young children by actively engaging them in everyday chores. Something as simple as picking up toys and other belongings can provide lessons in colour identification, sorting skills, and pattern formation. For example, asking kids to locate all of the green items, to put small things in one basket and large items in another area, to organise their toys according to certain specifications ("Please find all of the toys that make music.") or to identify patterns ("If we line up a blue car, then a red one and then another blue one, what colour would we put next in line?") helps kids to understand concepts that they will later apply in other areas. Outings are rich with opportunities for discovery, from learning about plants and animals on nature hikes to basics on budgeting and nutrition while making choices at the supermarket. Talking about which items are the healthiest and which are good values is thought provoking and gives children chances to stretch their thinking and reasoning abilities. Kids are always learning by taking in all that they see and hear around them - often without parents realising just how much their children are paying attention. Parents are often made aware of the fact that children are listening to conversations around them by hearing their kids repeat the things that they've heard said (not always a good thing…), so parents would be wise to surround their children with positive and thoughtful exchanges. One of the greatest ways to increase children's language skills is to engage them in conversations. That sounds obvious, but many parents and other carers have a tendency to talk "to" kids rather than with them. Asking children question that require more than simple "yes" or "no" answers gives them opportunities to expand their communication skills, vital for both academic and social success. Parents often complain that their children give them short answers to their questions and seem hesitant to share the details of their daily activities, but the key to getting children to open up is in the phrasing of the questions. If you ask a child "How was school?" you may get an answer of, "Fine." If, on the other hand, the child is asked about the funniest, scariest, or happiest thing that happened that day, the response is far more likely to be an engaging tale, rich with details. A good grasp of language can help children to excel in a number of areas, from understanding the written word to enabling them to clearly communicate with others. Playing word games with children during regular activities can help them to not only expand their vocabularies, but increase their confidence and competence in oral communication. Whether at home or while riding in the car, parents can play word games with their children. Rhyming words (even if the responses aren't all "real" words) is fun for kids, as are other word games, so parents should encourage a love of language by looking for opportunities to play with words. Parents can take turns with their children choosing a starting word and then looking for rhymes or clumping words into categories ("Lets think of all of the animals that we can."). As kids mature and their abilities increase, the games can be more difficult ("Lets think of an animal that starts with each letter of the alphabet. 'A' is for antelope. What is an animal that starts with the letter 'B'?"). Math and science are subjects that bring forth images of classrooms and laboratories, but both are important in everyday life. Kids can help their parents to measure ingredients during meal preparation or learn about photosynthesis while working in the vegetable garden. Applying educational concepts to real world situations makes them easier to understand once they are introduced in a classroom environment, so parents can give their children an academic advantage by looking for ways to incorporate lessons into everyday activities. Learning doesn't just happen at school; every waking moment provides children with opportunities for enrichment. Long before they enter a classroom for the very first time, kids begin their education. Parents can make a big difference in the lives of their children by realising that they are their kids' very first and most important teachers.